$6 cocktails, select beer and wine, and 1/2 price cheese fondue for two from 5-7p.m. Available at the bar Sunday - Friday! Enjoy a four course couples dinner for two including all the fixings for a perfect romantic night out. Link to Evening Under the Stars Enjoy a four course couples dinner for two including all the fixings for a perfect romantic night out. Kids eat free this Easter at The Melting Pot! View details for more information. Kids eat free this Easter at The Melting Pot! Join us for our Easter Brunch menu, $49.95 per person for a four course meal and receive a complimentary children's entree. * Even the Easter bunny doesn't bring anything that sweet! *Maximum 4 complimentary entrees per party, requires 1 to 1 purchase of adult Easter Brunch (or other 4-course combo), may not be combined with other promotions or discounts. Teaching kids? All day… all year!? Yup, you deserve a break (and maybe a cocktail). Get your team together and enjoy three courses of fondue for just $24.95. Teaching kids? All day… all year!? Yup, you deserve a break (and maybe a cocktail). Get your team together and enjoy our special menu – three courses of fondue for just $24.95. Add an entrée for $14.95 and enjoy feature cocktails starting at $7.95! We never need a reason to treat mom, but it’s still nice to have one! Enjoy a delicious four course dinner that will bring the whole family together. Mother's Day features a mandatory prix fixe menu. Vegan and vegetarian options are available. Speak to a manager or your server if you have dietary restrictions or concerns. Where would we be without the sacrifices and hard work of nurses? Join us for three courses of fondue and celebrate nurses, for just $24.95. Where would we be without the sacrifices and hard work of nurses? Join us for three courses of fondue (menu here) and celebrate nurses, for just $24.95. Add an entrée for $14.95 and enjoy feature cocktails starting at $7.95! Win a grill for dad! We’re serving up an ENDLESS entrée for all those hungry dads out there. Read more to learn how dad can win a grill. Win a grill for dad! * We’re serving up an ENDLESS entrée for all those hungry dads out there – $49.95. Kids three course meal, just $29.95. *Every reservation enjoying our feature Father’s Day menu will be entered to win a grill. Limit one entry per reservation, canceled or no-show reservations are not valid. Delivery of grill and gas are not included. Get some much needed "me time" every Sunday for brunch at the Melting Pot — a three course meal and endless mimosas or sangria, all for $29.95 per person! Sunday Brunch is back! Enjoy salad, entrees, chocolate fondue, and endless mimosas or sangria for just $29.95 per person. This special is available from noon to 3:00PM every Sunday. Reservations are highly recommended. *NEW* - Parking is easier than ever! Valet is right across the street from the restaurant for $10 per car. Enjoy a cozy dinner for two at The Melting Pot. Call for reservations and be sure to ask for our "Lover's Lane" menu. Read more for menu details. Our romance menu includes a completely customized four course dinner for two in our dimly lit Lover's Lane section, a bottle of champagne, and three roses for your special someone. Be sure to call for reservations so that we can hold one of best tables in the house for you! Menu is $149 before tax and gratuity. Interested in learning about romantic promotions? Sign up for Club Fondue to hear above all of our great events and to receive complimentary chocolate covered strawberries for your birthday and anniversary. Join us for lunch on Saturdays to take advantage of one of our lunch specials. 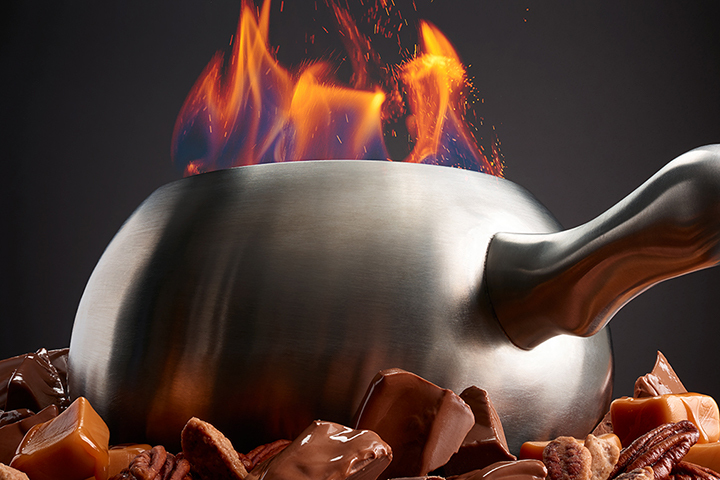 12 - 3 PM: Cheese fondue, entree, and chocolate fondue for $29.95 per person. 3 - 4 PM: Cheese fondue and chocolate fondue $14.95 per person. Reservations are recommended but walk ins are always welcome! Enjoy $6 cocktails, select beer and wine, and 1/2 price cheese fondue for 2, from 5 to 7 p.m. Sunday through Friday. Happy hour is only available at the bar. This promotion may not be combined with other promotions or discounts. Turn your dinner into a night on the town with these fun activities in White Plains. *May not be combined with other promotions or discounts. Only valid on the day of your show as stated on your ticket. We are proud to offer Gluten-Free, Vegan and Vegetarian Dining Options. Valet parking is available directly across the street on Mamaroneck Ave for $10 per car.